Visiting Chester, which sits outside Liverpool, England has continually appealed to people and their imagination of having lived there so long ago. Romans, Normans, conquerors, kings have come and gone, yet the cultural impact that was left behind and archaeological sites continue to amaze and astound generation after generation. As throngs of people plan to see and visit multiple, different cultural and historical settings across the globe, let alone England, there is little left to wonder why people choose to set course for the quaint town of Chester. Not only does the city have more than 2,000 years of history, but the city has kept the history alive and intact with museums, homes, streets and of course, the ancient walls of Chester. What makes the walls of Chester so enchanting? Is it perhaps that they were built during the Roman Empire approximately 70 A.D.? Is it because any tourist can walk the walls that surround an ancient city? Or is it because as many battles and people that have come across them, the walls have still remained? Whatever the reason may be, visitors are amazed by the majesty and engineering ability that the Romans had and how they have remained as a protection for so many years for Chester. As stated before, the walls were built between 70 and 80 A.D. by the Romans as a fortress, called Deva Victrix, but not completed until nearly 100 years later. What remains is truly remarkable including gigantic stones of the original foundation and the remnants of an old watchtower. History was lost concerning the Chester Walls for more than 700 years until 907 A.D. when the people of Mercia of the Anglo-Saxons, took back the city and fought off the vicious Vikings. The people repaired as much as they possibly could and there is even evidence today that shows how the people extended the walls during this time period. During the time of Norman invaders of 1066 to 1072, William the Conqueror advanced to Chester; he demanded that a castle be built. The castle sits outside of the city walls and overlooks the River Dee. From there, the walls were extended to embody the castle, leading to new gates and other parts of the wall being built as well. During the Middle Ages, there was anarchy throughout England. Chester was home to raids and uprisings. With Wales being a close neighbor, many Welsh armies attempted to take hold of Chester. With all of the chaos ensuing, the walls became a practical protector for the people of Chester. The walls have clearly tested time by remaining complete, with some battle scars, through countless sieges and England’s own Civil War. The walls have relied on financing through the years of England’s kings, queens and countrymen. The walls may have been started by Romans, but the English people certainly finished and have kept them unbroken through the years. After the English Civil War, 1642 to 1651, the walls served no other purpose for any type of military function. From 1707 forthwith, there have been numerous additions, alterations and improvements of the walls. New stairs, walkways, gates and roads were assembled or there was made room for them. A new bridge was constructed across River Dee during the 1820’s. Through the 1930’s and into the World War II, there were still new advancements in the roads and footbridges to help with all of the traffic flow. Major construction that had to do with Chester Walls still were ongoing up until the 1960’s when another footbridge had to be made. With the fresh renderings of the walls, they became more sought after for people to explore and take a more in depth look into history and what remained for over 2,000 years. The walls of Chester are famous throughout the world. Although there is more to Chester than just the immense walls. The River Dee has been vital for all the people throughout the many ages of Chester. With the river, trade was how the city of Chester became so prominent. The port has been long gone due to the area drying up, but the fragments of the past are still visible from parts of the wall. During the 1700’s, there was a lot of change in England. With the Civil War having ended, England moved on and rebuilt and renewed itself in many ways. One of the ways that it did was people had more time to socialize and relax since the war was over. People were able to enjoy more of life and thus began an addiction to be able to delve into the history of the walls. The town folk were able to walk throughout the walls of the city and the walls offers a place for socializing and solitude. For nearly 300 years it still makes a great place to walk and see all it has to offer in its’ tranquility. The vast walls of Chester are sure to not be missed! There are not many ancient sites that span 2,000 years of history in the world to this day. With all of the history, archaeology, romanticism, tales, stories and legends there is something for everyone to take part in this place of history. This is a stronghold that has an enormous impact on anyone. 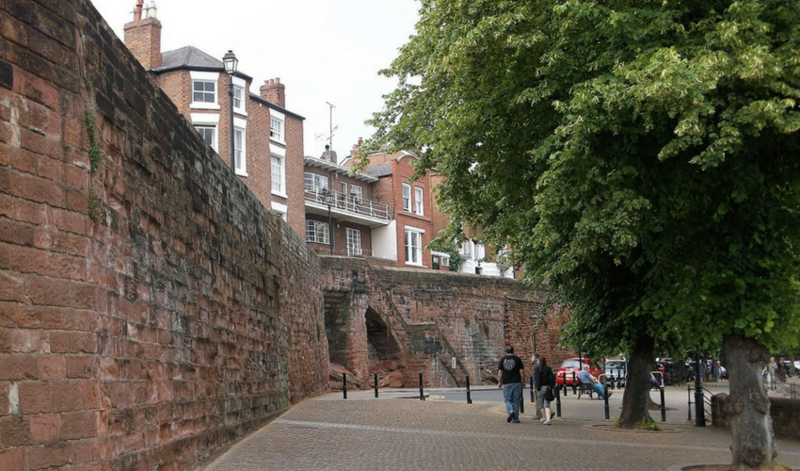 Take a walk along (also wheelchair accessible) more than just history; be enchanted by Chester’s City Walls!